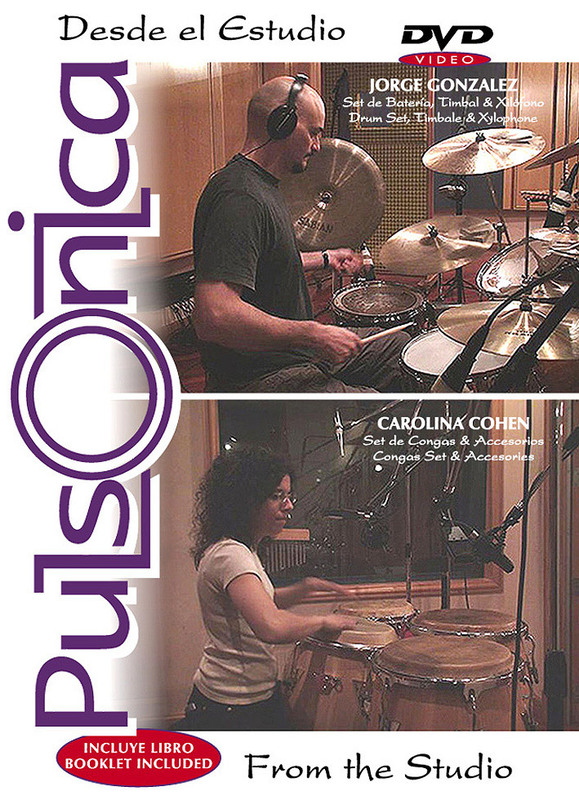 Video DVD "Pulsónica from the Studio"
The purpose of this video is to show you some creative works developed through the percussion sets at PULSONICA'S compositions and arrangements. A booklet with the transcriptions of patterns concerning to the passages explained at the present video is also included. Recorded at Sound Rec Studios, Buenos Aires, Argentine Republic. Drum Set, Timbale & Xylophone: Jorge González. Congas Set & Accessories: Carolina Cohen. Guitars & Programming: Marcelo Tubio. Guest Musicians: Keyboards: Sergio Gutiérrez. Bass Guitar: Patricio Resico. Mix & Mastering: Axel Sierra Bas. Video Edition: Leandro Patronelli. Produced by Jorge González & Leandro Patronelli. Ellisound Publications.